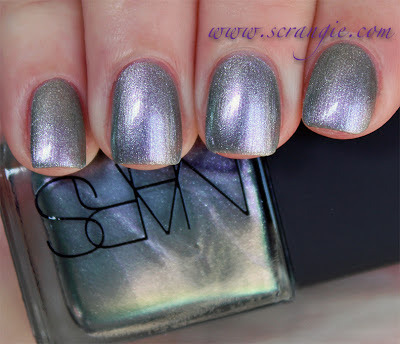 NARS Disco Inferno. 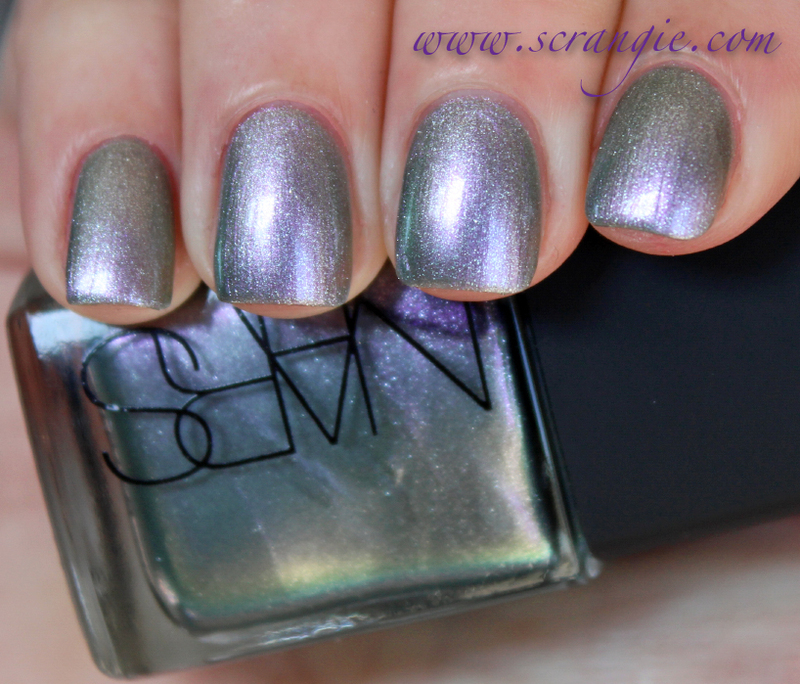 A light greyed purple-based, frost-finish multichrome. It starts out with grey edges and a blue-toned purple in the center of the nail, but shifts to blue, green and just a hint of orange, depending on the angle and lighting. The overall effect is soft and faded, keeping a grey-ness in every color it flashes. In addition to the multichrome effect, it also has a good amount of tiny silver foil sparkle. The formula on this was good. Thick enough to keep it from being runny, thin enough that it wasn't clumping or bubbling. It needs to dry for a minute or two between each coat, but otherwise decent application. It's pretty sheer and needs at least three coats to eliminate visible nail line. I did four here. Each additional coat enhances the duochrome effect. Dry time is average. Very cool polish, but not a unique color. It's basically the same as Wet n Wild Gray's Anatomy / Deborah Lippmann Wicked Game (and I'm sure there are others), just with a little more sparkle. It is more opaque than those two, but it's priced a few bucks higher than the Lippmann so it's not the most economical choice for a purple-grey multichrome. Super pretty, just kinda pricey. I'm disappointed they used the name Disco Inferno on such a trite color. Thanks for the review! I agree with Teresa. With a name like Disco Inferno, it should be a much more exciting color. It looks like a pretty cool polish...but yes, not that unique for the high price tag. Thanks for sharing! Just last weekend I picked up a random little bottle of Sinful Colors for $1.00, at Big Lots. The color is called "Polar Opposites #1156" and it looks ridiculously dupe'ish to this color. I didn't get it because it really is too close to all the other grey/green/purple shifting polishes. I love looking at them but I'll never wear them anyhow.